November 2017 – Miss Rita to the Rescue! Not messy like most glitter projects! Here’s my “quick and easy” guide to making beautiful ornaments! Please note: If you are planning on embellishing the outside of the ornament with vinyl, you need to consider the size and shape of the ornament as the surface is usually rounded. This takes some time and you may have some flubs, so practice. I PURCHASED the Grinch face svg on Etsy and all other images were purchased or in my collection. Please respect copyrights of artists! In my never-ending search for an easy meal that doesn’t require a lot of clean up afterwards, I happened upon this funky and absolutely delicious recipe. I’ve tweaked it a bit, because here in New England we simply don’t have some of the original ingredients available to us–for example, my hometown grocery store stocks Ro-tel tomatoes in the ethnic foods aisle and doesn’t even know what enchilada sauce is! Feel free to do the same…the recipe is pretty forgiving. One pot–guaranteed! Heat a large skillet or sauce pot for a minute to prevent sticking! Add olive oil and onions and cook for a minute or so then add your chicken. Cook for about 5 minutes over medium heat or until chicken is no longer pink. Into the same pot, add the rice, tomatoes, enchilada sauce, chicken broth, spices, beans, corn and about a cup of water. Stir to combine and bring contents to a boil. Reduce heat to simmer and cover pot. Simmer for about 20 minutes, stirring occasionally. You want to see the rice has fully absorbed the liquids, so add more time if using brown rice. Remove from heat, stir and let rest for a few minutes. Sprinkle with shredded cheese and/or optional toppings, if desired. See! 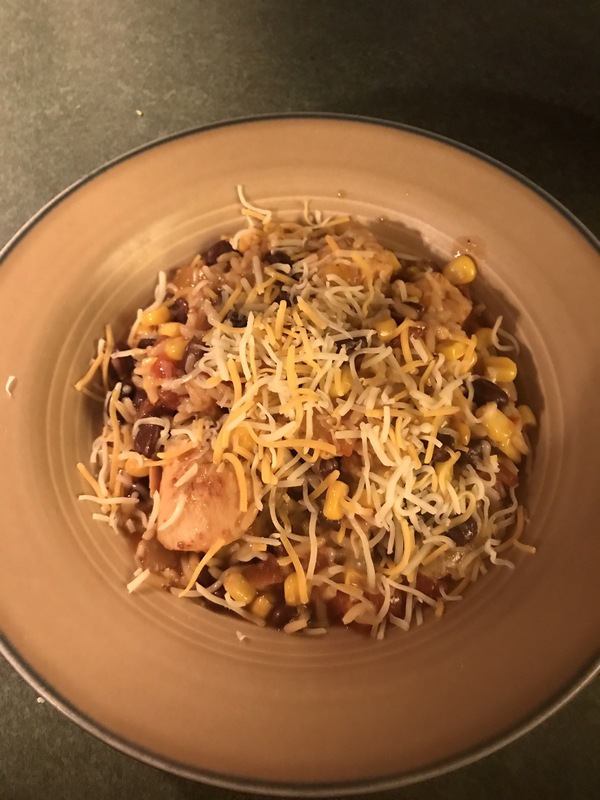 One pot of deliciousness…just like I promised! Lordy be! This child of mine is just too precious for words! From the moment he awakes–often by jumping out of bed–to when he falls asleep, MO is in motion. And talking. Moving and talking. All day, every day. He’s got only one setting–ON! Yesterday–being Election Day–MO had no school. He decided to come with me to vote and do errands. We vote at a church that is located across from my dear Auntie Anna and Uncle Sal’s old house. The neighborhood has changed a lot and I start to reminisce with MO. “Do they live there now?” he asks, to which I reply no. He’s not interested. He laughs and says he “doesn’t need a history lesson”. Finished voting, we set out for the electric company down the street. Along the way he says he’d like to “visit that place where we got the RECYCLE stickers” (meaning our City Hall) and asks if we “know” the mayor. I say, yes, we know him. His name is “Teddy” just like our dog. He asks me why I don’t run for mayor, because he thinks he would like it if I were mayor. (Watch out, Ted!) He likes the idea, because he thinks he would then “know everyone in the city” and wouldn’t that be great! Plus it would “give me something to do during the day”…because, you know, I simply do not have enough to do! As he is pitching the mayoral job to me, he exclaims: “Imagine all the paperwork you’d have to do!” as if that were a super big draw for me deciding to run for office. Arriving at the light plant, he spies a rocky wall and a few trees and asks if he can climb outside instead of going in. I agree. When I am finished, I don’t see him. But he quickly responded from behind a tree when I call him. He says he needs hiking boots (he does) to climb the terrain next time. He tries to decide when the “next time” will be. He thinks maybe Saturday, that is if I can get his new boots by then. Off we go to the post office, where he climbs one of trees there. We go inside and he finds a pen, which he puts in his trusty shirt pocket, delighted in his “prize”. When it’s our turn, I ask for bird stamps and he inquires if they are sticky backed. He says they must be sticky backed because “he doesn’t want them to fly away”. He waits for the postmistress to get his little joke, but she is all business today. Oh, well. Leaving the post office, he climbs the tree again and points out another one he thinks he could climb. He thinks he could break off one of the limbs if he “weighed 200 pounds or so” and then we get back in the car and head for the mall. Along the way, he asks if we can have sushi and perhaps look for a new jacket, because it’s getting cold out. He is, after all, wearing his beloved but too small short-sleeved shirt! At Old Navy, he picks out a vest and tries to convince me he can wear a small. We settle for a large one in camouflage green with fluorescent orange trim. 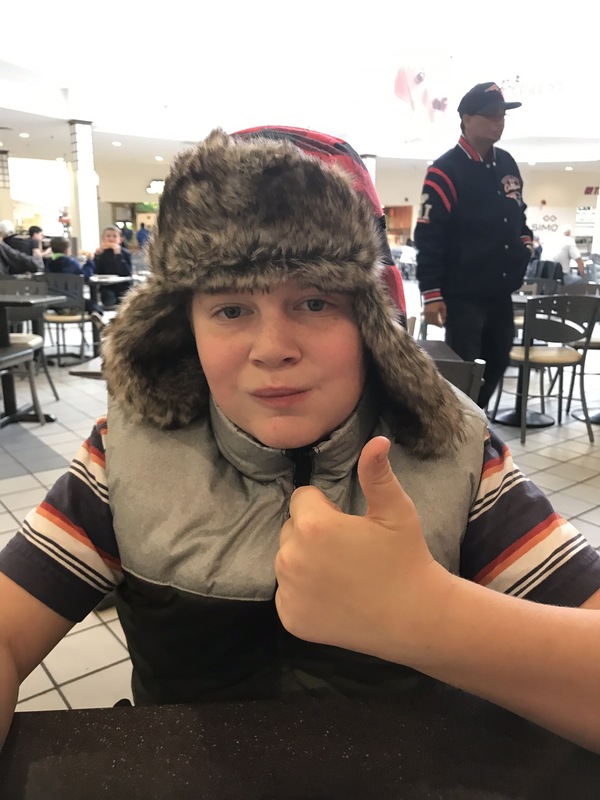 Seconds later he found a buffalo check hunting hat–complete with faux fur ear flaps–and refuses to take it off. I guess we are adding it to the list. We also find red slipper socks and women’s pajama bottoms with Christmas sweater wearing dogs all over them. One is a corgi, so we HAD to get them. He casually says I can hem them. At the check out he also gets a pack of Pop Rocks–red–he prefers blue. Could I try to find him blue ones tomorrow? At the sushi restaurant, he waits very impatiently for his order. Apparently it isn’t a good thing that they make his food “to order”, because it is taking way too long to be prepared. He gobbles the four pieces of ebi nigiri ( 🍣 sticky rice with a butterflied cooked shrimp on top) and wants more. I ask him how much more and he asks for eight more. Eight more pieces? So, four orders? “No” I say “that’s too much” so he settles for 2 more orders, which is 4 pieces. He wonders why the sushi chef gives him the pickled ginger (Ick!) and carefully removes the ball of wasabi paste and places it on my plate. When we get home, he wants to try out his new stuff. He decides the buffalo-checked and faux fur-lined hunting cap goes perfectly with his camouflage and orange vest. He adds a different short sleeve shirt, which also has a pocket because “wave of the future” and all. For good measure, he dons the new slipper socks and pajama bottoms–“too long, so can you hem them now?”–and decides this will be his ensemble for tomorrow. It’s only six o’clock the night before he plans on wearing them to school. With the hat, vest, pj’s, slipper socks and snow boots, he becomes hot. I suggest he put something else on until tomorrow, but he decides he’d rather turn on the air conditioner. All dressed up in his new attire, he hunts for his “dog tags” and then proceeds to tell me all about the history of dog tags, in case I didn’t know. Eventually I convince him to peel off the new clothes and get ready for bed. Bedtime is the hour or so before he actually falls asleep when he repeatedly turns on all the lights in every room and I follow him around and turn them all off. It doesn’t matter how many times I tell him to turn off the lights, he still leaves them on and I still follow him around and shut them off. This happens every night at least three times before he is ready for bed. After he wrestles with Ted E. Bear on the bed–with socks on his hands to protect them from random nips–he finally (finally!!) just <boom> closes his eyes and is asleep. Like I said before–there is no speed adjustment switch. There is only OFF and ON. You get one or the other. Believe me, I’ve checked! Are you tired? I know I am and I haven’t even included all the things I did around him! I wonder what other people do with twelve year old, autistic boys on their days off. But I also think about how boring my life would be without him. He sure is colorful! I thank the Lord for such an energetic child and think about “all that paperwork!” I might be trying to do as the elected mayor. I’m happy to let Ted take care of it for a few more years! 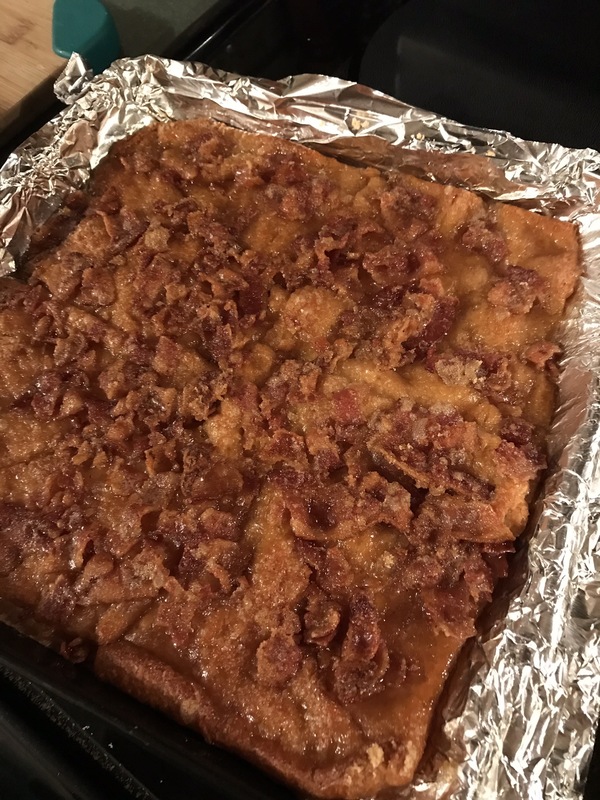 So…this wasn’t my idea and I’m not taking credit for it, but there was no printed recipe…just a video. Tiny bit of salt, aluminum foil and a pan. Line a 13” x 9” pan with foil. Sprinkle lightly with salt (keeps it from sticking). Open and spread out one roll of Pillsbury crescent rolls, pressing at the seams to make a flat surface. Using a fork, pierce the dough all over…like you would a pie crust (this is to keep it flat). Measure 1/4 cup of maple syrup and pour over dough…use a spatula to spread out evenly. Sprinkle with brown sugar…about six tablespoons. Repeat with more syrup and brown sugar. The house will smell awesome by the way! Bake at 325* for 25 minutes. Cool and it’s suppose to be crackable…like peanut brittle when cool…but I am having trouble waiting for that stage! 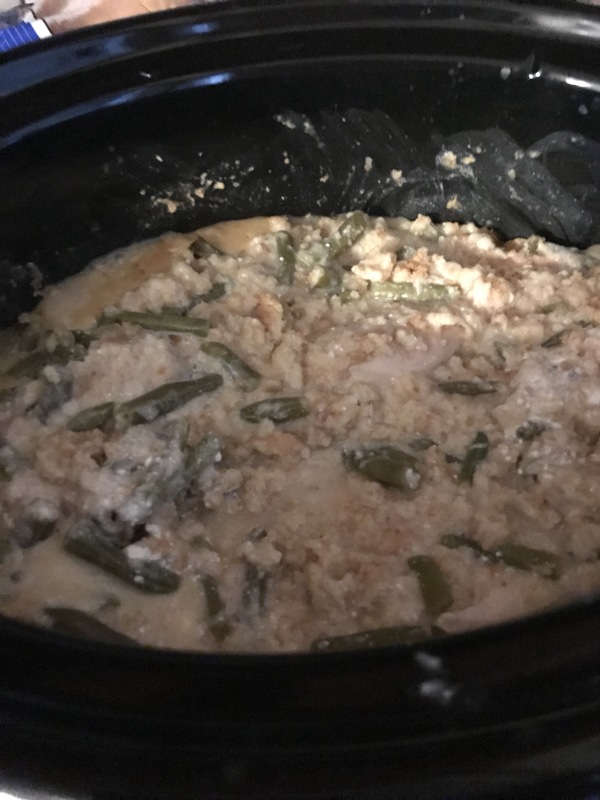 I can’t remember where I got the idea for this crockpot recipe, but I wish I could. This is easy and yummy and no special ingredients required. Makes a great weeknight meal and will especially go over well with people who love Thanksgiving leftovers. This is one of those easy peasy recipes. Place your chicken on the bottom of the crock first, then the stuffing and then the veggies. Combine the can of soup, sour cream and water (about a cup…add more or less to suit your needs) and blend a bit. Pour atop the other ingredients and mix it a bit with the stuffing. Season with salt and pepper, if you’d like. Cook on low for 6 hours or high for 3-4 hours; at about half way, I check to see if all my stuffing is covered with the soup mixture and add water if it looks too dry. Using a fork, gently shred the chicken breasts. Serve with some fresh cranberry sauce for a real Thanksgiving leftover feel!